For the professional golfer, see Vicente Fernández (golfer). For the professional footballer, see Vicente Fernández (footballer). This name uses Spanish naming customs: the first or paternal family name is Fernández and the second or maternal family name is Gómez. Vicente "Chente" Fernández Gómez (born 17 February 1940) is a Mexican retired singer, actor, and film producer. Nicknamed "El Rey de la Música Ranchera" (The King of Ranchera Music), Fernández started his career singing for tips on the street, and has since become a cultural icon, recording more than 50 albums and contributing to more than 30 films. His repertoire consists of rancheras and other Mexican classics. He is accompanied live by a mariachi group, but he is not technically a mariachi musician, as he only sings live. 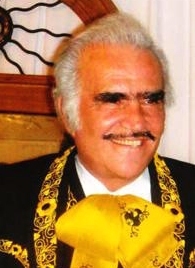 Vicente's fame rose after the death of Javier Solís (El Rey del Bolero Ranchero). Fernández at Pepsi Center on June 11, 2011. Fernández's work has earned him three Grammy Awards, eight Latin Grammy Awards, fourteen Lo Nuestro Awards, and a star on the Hollywood Walk of Fame. He has sold over 50 million copies worldwide, making him one of the best-selling regional Mexican artists of all time. In 2016, Fernández retired from performing live, although he continues to record and publish music. Born on 17 February 1940 in the suburb of Huentitán El Alto in Guadalajara, Jalisco, Fernández spent his early years on his father Ramon's ranch on the outskirts of Guadalajara. He also worked at a young age as a waiter, dish washer, cashier, and finally manager of his uncle's restaurant. "Chente", as he was known to all, became fond of the idyllic ranch lifestyle. His mother often took him to see the films of Pedro Infante; he has said of these films' significance: "When I was 6 or 7, I would go see Pedro Infante's movies, and I would tell my mother, 'When I grow up, I'll be like him.'" By age 8 he had taken up the guitar and was practicing singing in the style of the ranchera singers he heard on the radio. As a boy, Fernández sang at a festival in Arandas, Mexico where he won the contest. Later, at 12, he won 31 pesos in another contest. In 1954 he won an amateur contest sponsored by a Guadalajara television station. It was his first break into performing and he began to play at local clubs and gatherings. Around this time, however, Fernandez's father lost the ranch and the family moved into the city of Tijuana. Fernández, who had dropped out of school in fifth grade, began working jobs in the city such as janitor, dishwasher, waiter and whatever else he could find, all the while holding to his musical aspirations. In 1960, Fernández devoted himself to music full-time. He went back to Jalisco, where he performed as a busker and occasionally appeared on the television show La Calandria Musical. After a couple of years Fernández tried his luck in Mexico City, where he found a job singing in a restaurant called "El Amanacer Tapatio". When he wasn't working, he was auditioning -unsuccessfully— for record companies. Discouraged, he left around 1963 to marry Maria del Refugio "Cuca" Abarca Villasenor. They now have three sons: Vicente Jr., Gerardo, and Alejandro. Vicente Jr was born 3 months premature in 1963; Fernández's mother died the same week :(. In the spring of 1966, Javier Solís, Mexico's most popular traditional singer, died. Discos CBS, the recording label in the Mexican department of CBS Records International, offered Fernández a recording contract. He released his first recording, "Perdóname", with the company in 1966; Fernández still records for the label, which is now Sony Music Latin of Sony Music Entertainment. He branched into acting with the 1971 film Tacos al Carbón. His first hit movie, for which he did the soundtrack, was 1974's La Ley del Monte. He stopped acting in 1991. Maintaining the ranchera tradition, Fernández always performs wearing the charro, an embroidered suit and sombrero. Fernández has recorded more than 50 albums in 35 years and claims to have recorded 300 more songs, making another 30 albums possible even if he retires. When he records an album, he spends 12–13 hours in the studio recording up to 18 songs; he takes a day off, then returns for another marathon session of recording another 15 or more songs. From this accumulation, he and his producer choose 12 tracks. Fernández's greatest hit was "Volver, volver," released in 1972; his first million-selling album was 1983's 15 Grandes con el número uno. In 1987 he launched his first tour outside the United States and Mexico when he traveled to Bolivia and Colombia. On April 16, 2016 Vicente Fernández performed for the last time in his career at Estadio Azteca effectively announcing his retirement. In 1990, Fernández released the album Vicente Fernandez y las clásicas de José Alfredo Jiménez, a tribute to Mexico's famous songwriter José Alfredo Jiménez. The album earned him Billboard and Univision's Latin Music Award for Mexican Regional Male Artist of the Year, which he won 5 times from 1989 to 1993. In 1998, Fernández was inducted into Billboard's Latin Music Hall of Fame. In 2002, the Latin Recording Academy recognized Fernández as Person of the Year. That year he celebrated his 35th anniversary in the entertainment industry, a career in which he has sold more than 50 million records and was inducted into the International Latin Music Hall of Fame. He has 51 albums listed on the Recording Industry Association of America (RIAA) for gold, platinum, and multiplatinum selling records. He also has his own star on the walk of fame in Hollywood, California; over 5,000 people attended his star-presentation ceremony, which is a record itself. Fernández also has an arena in Guadalajara named in his honor, a star placed with his hand prints and name at the Paseo de las Luminarias in Mexico City. In 2010, Fernández was awarded his first Grammy Award for Best Regional Mexican Album for his record Necesito de Tí. On October 10, 2012, a stretch of 26th Street (a street in a Hispanic neighborhood of Chicago called Little Village) was named in his honor. In 2015, Fernández was awarded his second Grammy Award for Best Regional Mexican Music Album (including Tejano) for the album Mano A Mano – Tangos A La Manera De Vicente Fernández. The Grammy Awards are awarded annually by the National Academy of Recording Arts and Sciences of the United States. Fernández received three awards from thirteen nominations. The Latin Grammy Awards are awarded annually by The Latin Academy of Recording Arts & Sciences of the United States. Fernández received eight awards from fourteen nominations and also earned the Latin Recording Academy for Person of the Year. The Lo Nuestro Awards is an awards show honoring the best of Latin music, presented by television network Univision. Fernández received fourteen awards from thirty three nominations. ^[I] Each year is linked to the article about the Lo Nuestro Awards held that year. ^ a b "Vicente Fernandez". GRAMMY.com. 2014-03-17. Retrieved 2019-01-14. ^ a b Jeff Tamarkin (Rovi Corporation). "Vicente Fernández - Biography". Billboard. Prometheus Global Media. Retrieved 2012-08-15. ^ "Vicente Fernández Biography". Sortmusic.com. Retrieved 2015-11-13. ^ "World Music Legends Vicente Fernandez World Music at Global Rhythm - The Destination for World Music". Globalrhythm.net. 2005-10-09. Retrieved 2015-11-13. 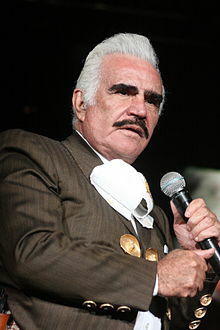 ^ "Vicente Fernandez Biography". Musicianguide.com. Retrieved 2012-08-15. ^ Burr, Ramiro (July 25, 1998). "Hats Off to the Music of Regional Mexican". Billboard. Nielsen Business Media, Inc. 110 (30): 49. Retrieved April 11, 2014. ^ "Vicente Fernández gana su primer Grammy anglo". Terra Networks Mexico. January 31, 2010. Retrieved May 27, 2011. ^ a b Vulpo, Mike (February 8, 2015). "2015 Grammy Award Winners: The Complete List". E! Online. Retrieved 9 February 2015. ^ "Complete List of the Nominees for 26th Annual Grammy Music Awards". Schenectady Gazette. The Daily Gazette Company. January 9, 1984. Retrieved May 14, 2014. ^ "List of Grammy nominations". Times-News. Hendersonville, North Carolina: The New York Times Company. January 11, 1991. Retrieved February 24, 2015. ^ "36th Grammy Awards – 1994". Rock on the Net. Retrieved June 24, 2010. ^ "The 37th Grammy Nominations". Los Angeles Times. Tribune Company. January 6, 1995. p. 3. Retrieved March 5, 2015. ^ "The Complete List of Nominees". Los Angeles Times. Tribune Company. January 8, 1997. p. 4. Retrieved March 5, 2015. ^ "Academy's Complete List of Nominees". Los Angeles Times. Tribune Company. January 6, 1999. p. 4. Retrieved March 12, 2015. ^ "A Complete List of the Nominees". Los Angeles Times. Tribune Company. January 5, 2000. p. 4. Retrieved July 17, 2015. ^ Boucher, Geoff (January 4, 2001). "Grammys Cast a Wider Net Than Usual". Los Angeles Times. Tribune Company. p. 4. Retrieved July 17, 2015. ^ "Complete List Of Grammy Nominees". CBS News. January 4, 2002. Retrieved March 12, 2015. ^ "Elizalde y K-Paz nominados al Grammy". Terra Networks (in Spanish). Telefónica. Associated Press. December 6, 2007. Retrieved March 12, 2015. ^ "Vicente Fernández gana su primer Grammy anglo". Terra Networks Mexico (in Spanish). Telefónica. January 31, 2010. Retrieved March 12, 2015. ^ "Here Is the Complete List of Nominees for the 2017 Grammys". Billboard. Prometheus Global Media. Retrieved 8 December 2016. General Past Winners Search: "Past Winners Search". The Latin Grammys. The Latin Recording Academy. Retrieved 2015-02-20. ^ "The Full List of Nominations Latin Grammy". Los Angeles Times. Tribune Publishing Co. 2014-11-20. Retrieved 2015-03-14. "Lo Nuestro 1989 – Historia". Univision (in Spanish). Univision Communications, Inc. 1989. Archived from the original on October 17, 2013. Retrieved September 9, 2013. "Lo Nuestro 1990 – Historia". Univision (in Spanish). Univision Communications, Inc. 1990. Archived from the original on October 15, 2013. Retrieved September 4, 2013. Lannert, John (June 1, 1991). "Latin Music Finds Harmony In Awards Crisp, Entertaining Tv Program A Breakthrough For Fledgling Trade Group". Sun-Sentinel. Tribune Company. Retrieved August 16, 2013. Lannert, John (May 24, 1991). "Hispanic Music Industry Salutes Its Best Wednesday". Sun-Sentinel. Tribune Company. Retrieved August 16, 2013. "Lo Nuestro 1993 – Historia". Univision (in Spanish). Univision Communications, Inc. 1993. Archived from the original on June 9, 2012. Retrieved January 3, 2013. "Univision Announces the Nominees for Spanish-language Music's Highest Honors Premio Lo Nuestro a la Musica Latina". Univision. March 27, 1996. Retrieved June 11, 2013. "Premios a Lo Mejor De La Música Latina". El Tiempo (in Spanish). Casa Editorial El Tiempo S.A. April 8, 1997. Retrieved June 10, 2013. Barquero, Christopher (1998). "Premios Lo Nuestro: Los galardones a la música latina serán entregados en mayo próximo". La Nación (in Spanish). Grupo Nación GN, S.A. Archived from the original on June 15, 2013. Retrieved June 14, 2013. "¿Quiénes se llevarán esta noche el Premio Lo Nuestro "99?". Panamá América (in Spanish). Grupo Epasa. May 6, 1999. Archived from the original on June 15, 2013. Retrieved June 15, 2013. "Lo Nuestro tiene sus candidatos". La Nación (in Spanish). La Nación, S.A. de C.V. April 15, 2012. Archived from the original on 2013-06-24. Retrieved June 18, 2013. "Seis nominaciones para Son by Four". Que Pues (in Spanish). Grupo Editorial Zacatecas, S. A. de C. V. January 9, 2001. Archived from the original on June 16, 2013. Retrieved August 13, 2013. "Premios Lo Nuestro: Votación 2001". Univision. Univision Communications Inc. 2001. Archived from the original on November 29, 2014. Retrieved August 14, 2013. "Premios Lo Nuestro: Alfombra Roja: Lista completa de los ganadores de Premio Lo Nuestro 2001". Univision. Univision Communications Inc. 2001. Archived from the original on October 13, 2013. Retrieved August 14, 2013. "Premios Lo Nuestro a la Musica Latina: Lo que fue Lo Nuestro en 2002". Univision. Univision Communications Inc. 2002. Archived from the original on October 13, 2013. Retrieved August 14, 2013. "Premios Lo Nuestro: Votación Video del Año". Univision. Univision Communications Inc. 2002. Archived from the original on September 29, 2013. Retrieved August 20, 2013. "Univision Announces Winners of Premio Lo Nuestro 2003". Business Wire. Gale Group. February 6, 2003. Retrieved September 12, 2013. "Ricky Martin, Shakira, Thalia and Juanes Among Superstar Nominees for Premio Lo Nuestro 2004 Latin Music Awards". Business Wire. Gale Group. January 14, 2004. Retrieved August 23, 2013. "Ganadores de los Premios Lo Nuestro 2006". Terra. Telefónica. February 23, 2006. Retrieved August 24, 2013. "Halaga a Vicente Fernández Premio Lo Nuestro a la Excelencia". El Informador (in Spanish). Unión Editorialista. February 8, 2008. Retrieved September 12, 2013. "Ganadores de premios Lo Nuestro 2009". Sipse (in Spanish). March 28, 2009. Archived from the original on September 13, 2013. Retrieved September 12, 2013. López, Diego (February 19, 2010). "Aventura se lleva la noche en los Premios Lo Nuestro 2010". Yahoo! (in Spanish). Archived from the original on June 12, 2015. Retrieved September 12, 2013. "Sony Music Nominees for Premio Lo Nuestro 2010". SML Press (in Spanish). 2010. Retrieved September 12, 2013. Alonzo, Fabricio (February 6, 2012). "Lista de nominados a los premios Lo Nuestro 2012". Starmedia (in Spanish). Archived from the original on December 15, 2014. Retrieved September 12, 2013. "Premios Lo Nuestro 2013: estos son los ganadores". El Comercio (in Spanish). February 22, 2013. Retrieved September 12, 2013. "List of Nominees Premio Lo Nuestro Latin Music Award 2014" (PDF). Univision. Univision Communications. 2014. Archived from the original (PDF) on December 12, 2013. Retrieved December 9, 2013.